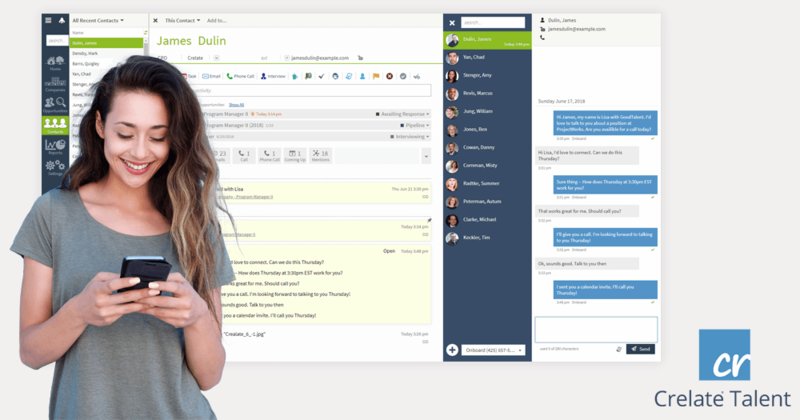 Kirkland, WA — Crelate, the recruiting software company that empowers staffing and recruiting agencies to manage talent and opportunity in a single solution, today announces the addition of a complete suite of in-browser text messaging features. Text Messaging by Crelate is available today to all Crelate customers as an add-on to their existing subscription. Optimizing the candidate experience is more critical than ever. More and more candidates want to engage potential employers with their mobile devices, and businesses need to adapt to that desire. With Text Messaging by Crelate, recruiters can send and receive text messages directly from their web browser. The new texting feature has been specially designed to help recruiters multi-task and easily manage multiple text conversations in one place. The improved capabilities will save time, reduce redundant tasks, and help busy agencies better engage with more candidates. Data from the Bureau of Labor Statistics show that younger generations change jobs more often than previous ones, and low unemployment rates mean that available talent gets picked up quickly. Tools that shorten overall talent lifecycle and keep recruiters’ time to placement as low as possible are a huge asset for growing businesses. Text messaging is one of those tools. Study after study has shown that texting achieves significantly higher response rates than email; up to eight times higher according to some. Additionally, text messaging is immediate communication that’s free of the back-and-forth of email and is immune to the phone-tag games that come along with telephone outreach. With integrated text messaging, conversations are tracked automatically within the Crelate Talent application. Centralizing texting into the agency’s system of record helps teams measure and improve their outreach and hiring performance. Seeing email, text and other communications channels in one system means busy recruiters and hiring managers can avoid redundantly contacting candidates and more easily collaborate throughout the hiring process. Because candidate sourcing can involve thousands of interactions across hundreds of candidates, Crelate’s texting features include configurable templates. With text messaging templates, interactions can be standardized, measured and improved over time. These improvements continue Crelate’s efforts to deliver a complete recruiting and talent engagement platform that helps connect more people with more opportunities more often. Text Messaging by Crelate is available today as an add-on subscription to all subscribers of Crelate Talent. Founded in 2012, with over 750 staffing and recruiting agency customers, Crelate is committed to helping talent-focused businesses grow and improve their relationship with an increasingly dynamic global workforce. Crelate provides fast, flexible recruiting software that manages both the applicant tracking process and sales process in a single unified recruiting solution.